Sunflower seeds are a tasty and healthy snack packed with nutrients and antioxidants that are very good for you. Sunflower seeds also contain high levels of omega-3 fatty acids that help reduce inflammation and keep your heart healthy. Consuming sunflower seeds every day also helps to improve your digestion, lower your blood pressure, and calm your nerves. Although sunflower seeds contain fat, most of the fat content is polyunsaturated fat. A 1 oz. serving of sunflower seeds will provide you with vitamin E, B-group vitamins, copper, manganese, magnesium, and phosphorus. Eating an ounce of sunflower seeds every day won’t make you fat because they contain 164 calories. In this article, you will learn about scientific studies that show why sunflower seeds are good for you. Sunflower seeds come from the sunflower plant (Helianthus annuus). Sunflower seeds or kernels have black or stripped hulls around them. You can enjoy sunflower seeds without their hull as a delicious snack, sprinkle them on salads, or add to other foods to give them a crunchy texture. 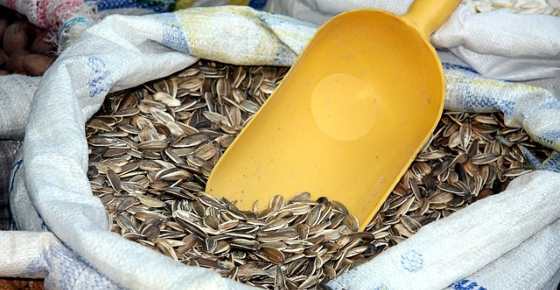 Sunflower seeds are also pressed to extract the oil from them. Sunflower oil has become popular because it is high in polyunsaturated and monounsaturated fatty acids. However, you will find out at the end of this article why many people tend to avoid sunflower oil now. Sunflower seeds are also good to eat if you have a nut allergy because they are seeds and not nuts. You get many of the same health benefits from sunflower seeds as you would from nuts. Consuming sunflower kernels or seeds is a great way to help boost your health and strengthen your immunity. Sunflower seeds are easy to consume regularly and can give you a good energy boost. For example, 2 oz. (56 g) of sunflower seeds contain 328 calories. However, this also gives you 5 grams of fiber and 12 grams of protein which is around 20% of your daily requirements. An ounce (28 g) of sunflower seeds contain 5.6 grams of carbs and also have a very low glycemic index. Eating sunflower seeds regularly can help to strengthen your immune system due to the high levels of antioxidants. For example, a 1/4 cup serving (35 grams) of sunflower seeds contains 12 mg of vitamin E which is over half of your recommended daily intake (RDI). It’s good to eat sunflower seeds every day because they contain trace minerals that are important for your health: A 1 oz. serving of sunflower seeds contains 91 mg magnesium which is 23% of your RDI. This small serving of sunflower seeds also contains copper, manganese, selenium, iron, and phosphorus. Sunflower seeds are not fattening for you if you consume them in reasonable quantities. Because sunflower seeds are so small and very delicious, it is very easy to eat too many of them. When it comes to fat content, the good news is that sunflower seeds mainly contain unsaturated fats. Sunflower seeds can only make you fat if you eat too many of them regularly. Even though they contain a lot of fat, sunflower seeds are certainly not bad for you because they mainly contain healthy fats. Another reason why you can eat moderate amounts of sunflower seeds without worrying about becoming fat is that they have complex carbs that release energy slowly. This will also help keep you feeling fuller for longer. So, consuming a handful of sunflower seeds will help to fight hunger pangs and prevent you from snacking on unhealthy snacks. To help prevent weight increase from eating sunflower seeds, weigh out appropriate portions beforehand. The many benefits of sunflower seeds become apparent when you view the nutritional value of sunflower seeds. Sunflower seeds also contain trace amounts of vitamin C, B-group vitamins, zinc, calcium, potassium, and zinc. Let’s look in more detail at the amazing health benefits of sunflower seeds. The high levels of healthy fatty acids and antioxidants in sunflower seeds mean that they can help keep your heart healthy. Find out what other simple changes you can do to help prevent having a heart attack. One of the ways that consuming sunflower seeds promotes good heart health is that they help reduce cholesterol. Learn about what you can do to reduce levels of bad cholesterol. Eating a handful of sunflower seeds every day is good if you have high blood pressure because the seeds have an anti-hypertensive effect. Find out what else you can do to reduce your blood pressure naturally. Another reason to eat a serving of sunflower seeds daily is that the high levels of antioxidants in sunflower seeds have immune-strengthening properties. Find out what other foods you can eat to strengthen your immune system. Eating more sunflower seeds in your diet will also improve the appearance of your skin in general. Sunflower seeds are rich in vitamin E which is an essential component for healthy skin. In fact, consuming 1/4 cup of sunflower seeds a day (approximately 35 grams) will give you nearly 60% of your daily vitamin E requirements! Strengthening your bones is another great reason to start consuming more sunflower seeds daily. The mineral content in sunflower kernels may also help to prevent osteoporosis. Learn about the importance of vitamin D in bone health and other ways of preventing osteoporosis. Eating sunflower seeds every day will also give you a good amount of fiber that will help keep your digestive system working well. For example, consuming 2 oz. (56g) of sunflower seeds will give you 5 grams of fiber which is 20% of your daily fiber requirements. To help your digestion working properly, find out some other ways of improving your digestive health. The high levels of magnesium in sunflower seeds may also have a calming effect on your mind. There is no evidence to suggest that consuming sunflower seeds alone can help relieve anxiety. However, 1 oz. of sunflower seeds contains 23% of your daily magnesium needs. If you suffer from stress and anxiety, try out some of these 14 effective remedies for anxiety issues. If you suffer from diabetes, then regular consumption of sunflower seeds can help to manage your symptoms. Did you know that sunflower seeds are just one of the many foods that help control type 2 diabetes? There is growing evidence to suggest that sunflower seeds have compounds that can help to treat and prevent certain types of cancer. Of course, more research has to be done in clinical trials to see how antioxidants in sunflower seeds can be used for treating cancer. Sunflower kernels are a delicious snack with a nutty flavor that can be enjoyed by most people but some people are allergic to them. One of the benefits of consuming sunflower seeds is that they can be enjoyed by people who suffer from tree nut allergies. However, some people are allergic to sunflower seeds. If you suffer from acne, you may be advised to refrain from consuming sunflower seeds. Consuming too many sunflower seeds every day could increase levels of omega-6 and result in inflammation in your body. Sunflower seeds are incredibly versatile. They are very tasty so you can snack on them just as they are with no further modification. Alternatively they add a lovely crunchy texture to salads – consider using them in place of croutons! The seeds work well in rice dishes such as pilafs (they are a good alternative to pine nuts) and can be used to add crunch to baked goods. The only limit is your imagination. You can buy sunflower seeds unshelled (they will still have their characteristic black and grey striped husk) or already shelled. If your seeds still have their shells on, they can be kept in a cool dry place. If they have been shelled, it’s best to store them in an airtight container in the refrigerator. This will prevent the fat inside from turning rancid. When choosing your seeds avoid any batches that look dull, withered or smell slightly off. Adding nuts to your daily nutrition is also one of the 70 habits featured in my e-book 70 Powerful Habits For A Great Health which will guide you how to take positive steps to improve your wellness and overall health. How about those already unshell and oven cooked, are the health benefits still in there? I couldn’t find specific information that compares the nutritional profile of raw vs roasted sunflowers. However, generally speaking, some nutrients are lost during roasting, depending on the roasting temperature, the roasting time and the nut type. Therefore you can help minimize the damage by roasting at a low temperature for shorter period of time.